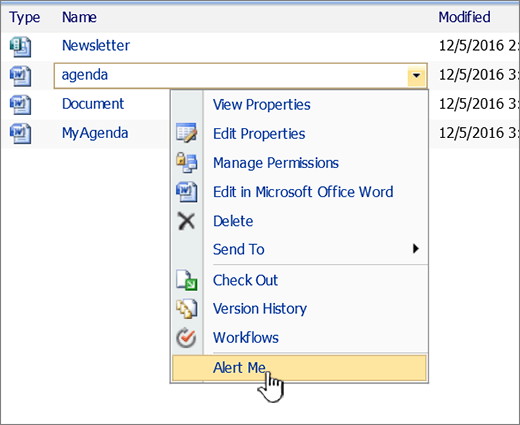 To stay updated when your SharePoint documents or items on your site change, you can create alerts. Alerts can be sent to your team via email or text messages (SMS), depending on how your administrator has set up the server. 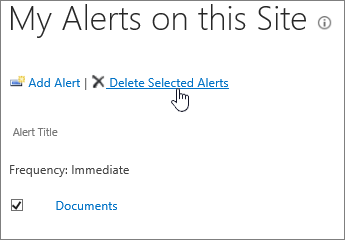 If your site is part of an Office 365 subscription, alerts are enabled when your site is first created. If your site is part of an on-premises SharePoint deployment that your organization manages alerts and email on its own. 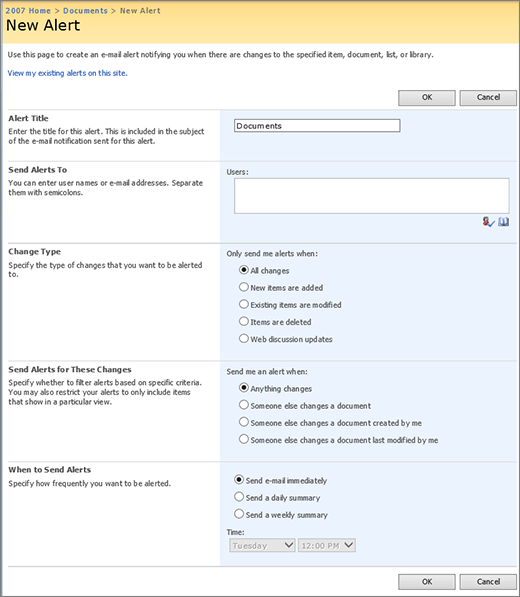 A server administrator must configure outgoing e-mail in SharePoint Central Administration before you can receive an alert as an e-mail message. 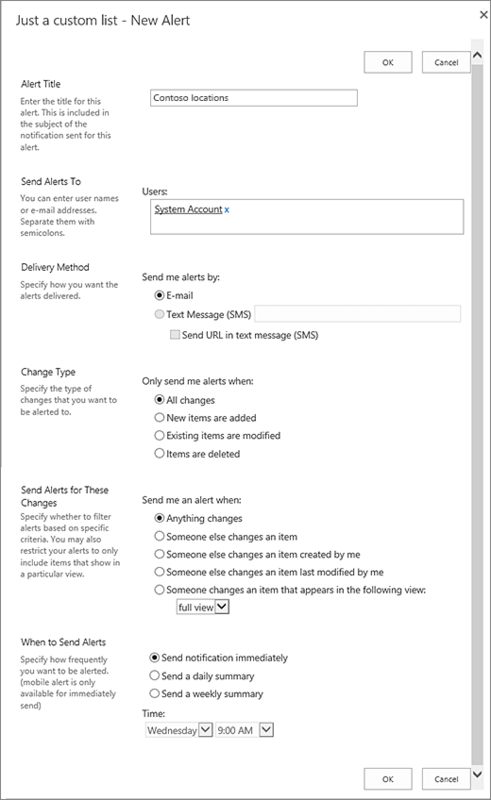 Similarly, before you can receive an alert as a text message, a server administrator must enable the SMS/MMS service settings in Central Administration. Another way of getting notifications is to use RSS feeds. For more info, see Create or subscribe to an RSS Feed. Updated December 20, 2016 thanks to customer feedback. 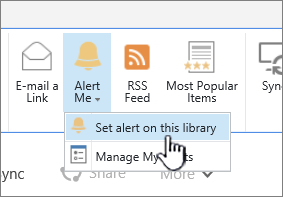 Go to the SharePoint library or list where you want to set the alert. If you’re looking at a view of the list or library on another page, you may have to click the title of the list or library first. For example, you may have to click Documents first to go to the Documents library. To set an alert for the entire library or list, click Library or List, and then click Alert Me, and then click Set alert on this library. 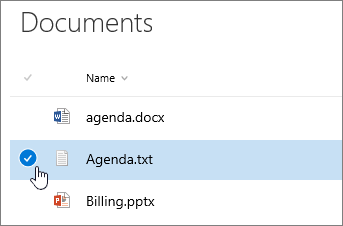 To set an alert for a document, select the document and click Files or Documents, then click Alert Me, and then click Set alert on this document. 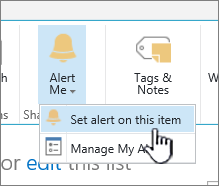 To set an alert on a list item, select the item and click the Items tab, then click Alert Me and then click Set alert on this item. Select the options you want for the alert. For settings and descriptions, see Alert Options below. Note: The exact names of the tabs and buttons in steps 1 and 2 vary if you are in a specialized library or list, such as a picture library, tasks list, or calendar list. For example, a calendar list has Events and Calendar tabs where you can find Alert Me. Depending on how your site and servers are set up, the person you created an alert for might receive an e-mail message that confirms that you created an alert. The alert e-mail message might provide links to the list or library, alert settings, the name of the person who created the alert, a mobile view, and other information and commands. 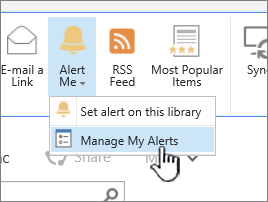 Click Library or List, click Alert Me, and then click Manage My Alerts. 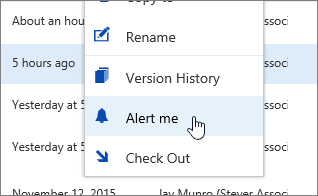 To set an alert on a list or library, on the Actions menu , click Alert Me. 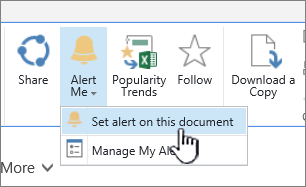 To set an alert on an item or document, point to the item for which you want to create an alert, click the arrow that appears, and then click Alert Me. 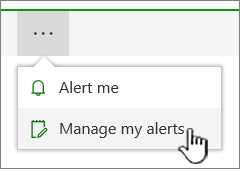 On the New Alert page, select the options you want for the alert. For settings and descriptions, see Alert Options below. Depending on how your site and servers are set up, the person you created an alert for may receive an e-mail message that confirms that you created an alert. The alert e-mail message may provide links to the list or library, alert settings, the name of the person who created the alert, a mobile view, and other information and commands. On the New Alert page, click View my existing alerts on this site. Find information about how to configure outgoing e-mail, or the SMS service see Configure outgoing email for SharePoint or Configure mobile accounts in SharePoint.